The former England Schoolboys International goalkeeper started out at Wrexham, making some 40 appearances for the Welsh club. During his spell there, he arrived at Nene Park on a one month loan in December 2000 as cover following No.1 Billy Turley’s sending off at Dover. He played just two games for Diamonds before returning to Wrexham. In 2003, he joined Sheffield United for a season, during which he went on loan to Macclesfield Town for a short period. At the beginning of the 2004/2005 season, he joined Conference North side Worksop Town, where he produced some fine performance. 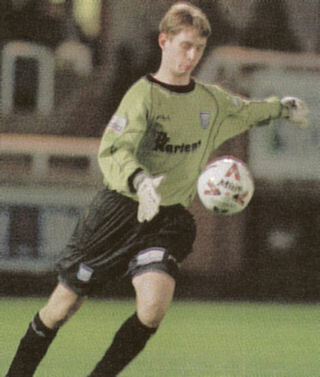 He returned briefly to Wrexham to cover for a goalkeeping crisis, before joining Northwich Victoria. In August 2006, he joined League of Wales side Port Talbot Town where he spent three seasons as their No.1. On 14 August 2009, he joined another Welsh Premier side Airbus UK Broughton. He then had another spell with Port Talbot, before joining Afan Lido in January 2013. No record of his involvement with the game has been found between 2014 and 2018.